(Southern Weekend) A Letter From Deep Inside History: Forty-four years later, finally some red guards apologize publicly. November 4, 2010. While this is not an isolated case, public apologies is still rare at present. The apologies and reconciliation arrived forty-four years later. Fortunately, it is not too late. If the apologies are not made, the victims and victimizers will be too old. This list could have been longer. In 1966 when the Cultural Revolution began, the Red Guards consisting of mostly middle school students swept all across China. According to official statistics for Beijing (where Cheng Bi and others were), the Red Guards killed 1,772 persons. Chen Bi, Guan Qiulan and Li Huangguo escaped with their lives in the violent turmoil, but some of their colleagues were among those who perished. Shen Xiaoke, Hu Bin and Guo Canhui were violent members of the Red Guards back then. On October 21, <Southern Weekend> published the letter of apology from Shen Xiaoke and Hu Bin to teacher Cheng Bi. In the letter, the retired worker Shen Xiaoke begged Cheng Bi: "Please forgive us." He said that a fellow student began crying over the telephone after admitting to having kicked a teacher. Cheng Bi replied in a letter: "You have made a good start." In the exchange of letters, Shen Xiaoke regarded Cheng Bi as his mother, while Cheng Bi told the 60-something-year-old Shen that "you were all good students." These old people spoke in the same way as teachers and children did several decades ago. The rock of history is being slowly eroded by the salt of repeated reflections. What happened between Cheng Bi versus Shen Xiaoke and Hu Bin also took place between other teachers and students. Our reporter has done enough investigation to know that this case was not an isolated one, even though public apologies are still rare before the entire historical truth is made known. The apologies and reconciliation arrive forty-four years later. Fortunately, it is not too late. On September 18, the number of alumni who came to the Beijing International Convention Center for the 50th anniversary celebration of the Beijing Foreign Language School was more than expected. The former Party Secretary Cheng Bi is already 86 years old. She wrote in the school's anniversary book: "I love this school. It gave me wonderful memories." The initial idea was to hold a moment of silence during the celebrations for the principal and other teachers who died during the Cultural revolution. But many people opposed the idea because it was inconsistent with the harmonious mood of the day. Therefore the master of ceremony only said: "We regret that principal Mo Ping and others cannot attend today." Mo Ping died. In 1966, he was severely beaten. At the peak of the Cultural Revolution in 1968, he "committed suicide." But this was not the first time that the former Red Guards expressed their feelings towards those teachers whom they persecuted. Before the celebrations, a group of former students wrote a letter of apology to Cheng Bi. On the day of the celebrations, a student came out of the darkness to deliver an oral apology to Cheng Bi who was sitting in the first row. Shen Xiaoke whose letter of apology was published in <Southern Weekend> retired several years ago. Another letter writer Hu Bin is living overseas. Shen Xiaoke left the school in 1968 to work in Inner Mongolia for three years. In 1971, Shen Xiaoke left the country and went to Hubei. He retired from the the Number Two Automobile Factory in Shiyan city several years ago. As a technician, Shen Xiaoke was interested in history and he loved to read books. "Why was there a Cultural Revolution? Why was it inevitable? The teachers were such good people. It was so unfortunate." He said. Shen Xiaoke wrote the letter of apology to relieve certain things inside his heart. He wrote a story titled <The Son of the Enemy> published in <People's Liberature> magazine in 1986. The story was not complicated: The brutally tortured A escaped and set the house of his enemy B on fire, kidnapping B's son with him. Many years later, A told B to fetch his son. B chose to jump off a cliff. "B saw his son, but what can he say?" Shen Xiaoke thinks that the same unlikely thing can also happen in real life: "What can a student who beat up a teacher say to that teacher later?" Early this summer, 63-year-old Shen Xiaoke finally sent out the letter of apology. He sent it first via email to a fellow student in Beijing. Although he was regarded as a thoughtful, daring person, he was not pressure-free and he asked that fellow student not to publicize it. Early this summer, he visited secretary Cheng Bi with the letter of apology printed by his fellow student, everybody at the scene (including Cheng Bi and other fellow students) were surprised. "How did this come about?" Previously, nobody had ever apologized her Cheng Bi. In the astonishment, someone took photos while someone else read the letter out to her. Cheng Bi could not adjust: "I don't remember Shen Xiaoke beating me. He was a good child." Although Shen Xiaoke did not use violence on his teachers, he did wear a red armband and yelled "Down with ..." against his teachers. He was disconsolate: "I used the various then current viewpoints to denounce my teachers, including teacher Cheng Bi." Shen Xiaoke recalled. He typed that letter of apology with tears in his eyes. At the other side of history, Cheng Bi said that she only cried twice. On one occasion during a criticism session, she cried "Long Live Chairman" together with the others. Someone beat her and asked why this capitalist roader should chant that slogan. On the other occasion, she wore a pair of "liberation army shoes" during her labor reform stint and the Red Guards did not think that she was worthy. Guo Canhui was the class monitor of the fourth-year middle school class at the Beijing Mining Industry Auxiliary Middle School in 1965. At 4pm on July 11, 2009, he apologized to his teacher Li Huangguo. In the company of six or seven classmates, the inarticulate Guo Canhui met with Li Huangguo and her family. In five minutes, he clearly described his mistakes back then. In truth, he had reconciled with teacher Li Huangguo in the 1970's. In 1974, he returned from the Yunnan countryside to Beijing and he visited teacher Li Huangguo. At the time, Li Huangguo joked with him: "You were awesome. You dragged me out to be criticized alongside central party leader Lu Dingyi (then the Minister of Propaganda)." In a late 1980's meeting, fellow students saw him sitting next to teacher Li and chatting nicely. But for classmates Zhang Dazhong and others, it is one thing to sit and chat with the teacher but it is something different to issue a solemn and formal apology to the teacher. Now that these former Red Guards have children and grandchildren, they are beginning to want to apologize. During class reunions, Zhang Dazhong and other students felt very bad when they discussed the current situations of their teachers. Among the Red Guards, some of them beat up teachers but others did not. But they have gradually reached a consensus: "We must acknowledge our mistakes even if it means getting down on our knees and kowtowing." On that day in 2009, Guo Canhui described his mistakes and took three deep bows to teacher Li Huangguo and her family twice. The teacher sat there expressionlessly. In 2001, 70-year-old Li Huangguo was diagnosed with depression and hallucinations. She would look at the window and scream: "Someone is trying to come through the window to launch a criticism session against me." Guan Qiulan is 81 years old now. She is hard of hearing and speaks loudly. Like many elderly people, this former Peking University Auxiliary School teacher was unwilling to mention the criticisms that fell upon her during the 1960's and 1970's. She only said briefly, "Nothing was stable during those ten years." The "fear" left behind from the Cultural Revolution was not just an inner feeling. It was a psychological syndrome that remained buried inside the survivors. Female teacher Li Huangguo was also criticized during the Cultural Revolution, but she reacted differently. The memories of the terror were not erased from her memory. Instead, they became clearer over time. Several years ago, her health began to deteriorate as her speech and consciousness slowly ebbed away. But during her illness, she would sometimes be brought back to that past in dreams only to wake up screaming "Don't beat me!". Since Li Huangguo's child is overseas, her former students Zhang Dazhong and Wang Fengwei joined with others to take care of her. Several years ago, teacher Li ran a fever and was taken to the emergency room at the Number Three Beijing Hospital. Wang Fengwei got the call and hurried over to be with Li. After the CT scan, Li was taken to the psychiatric hospital Number Six Beijing Hospital. Wang Fengwei saw that Li resisted vigorously to being put inside a psychiatric wardroom with bars on the window and a lock on the door. The contrition of Guo Canhui cannot change the fact the Li Huangguo suffers from dementia. But it was very important and gratifying for Li Huangguo's husband Dan Zhongjian. "This day has finally arrived" for Li "who suffered terribly during the Cultural Revolutoin." Dan Zhongjian regarded the apologies this time as the reflection of an entire class and a forward step for society. Dan Zhongjian even tried to dissuade Guo Canhui from apologizing, as did some other students. But Guo was adamant: "I cannot refuse to admit my past mistakes just because I am old now or because of the social conditions. If I had been wrong, then I was wrong." He even told the reporter about the details of the two assaults on teacher Li Huangguo. "Head shaving" and "dragging her out of her home to kneel on a 10cm wide stool, plus beating." He had never told this to his family or friends. "It was typical humiliation." In a Beijing coffee house, he finally poured out his heart. As a veteran Red Guard, Guo Canhui left the organization in late 1966. He has never joined any other organization since. He remembered that before the Cultural Revolution began, teacher Li Huangguo who had been expelled from the party for being a rightist told him privately not to be so passionate. On November 3, Guo Canhui was rueful: "If I had listened to teacher Li back then, I would never have made so many mistakes." Class 5, third-year elementary school, male: The letters of brothers Xiaoke and Hu Bin reflected our voices. We hope that secretary Cheng can see our shame, and we can imagine that principal Mo will understand our contrition from heaven. We don't want to shift responsibility to other people. We only want to find a little bit of common conscience during the process of purifying our hearts and minds. Class 3, fourth-year elementary school (who became a school teacher later): It was only after I became a teacher that I understood the meaning of being a teacher ... The letter of apology from Comrade Xiaoke is a hidden pain in the hearts of our generation. Class 1, first-year elementary school, female: Your letters touch the softest spot in my heart ... every person needs to reflect seriously. This page of history must be glossed over without resolution. Class 2, first-year elementary school, male, presently residing in the USA: "I will try to come back to Beijing to attend the commemorative activities. I will definitely apologize to the school leaders and teachers in person." After receiving the letters of apologies from the students, Cheng Bi was very touched. "I ought to let the children know about my thinking." Less than one week later, she replied. In the letter, she wrote: "I believe that you were victims too. At the time, the children who didn't understand anything joined in the uproar; even those children who understood were under pressure. They were afraid that they could not keep up with the times, they were afraid to make mistakes." In retrospect, it was not just Shen Xiaoke and other "Little Red Guards" who got caught up with the red tide that swept away commonsense and feelings. On the first day when the Chairman Mao badges were released, teacher Guan Qiulan was serving labor reform. A first-year middle-school student refused to sell her a badge. Guan got made and said, "If you don't sell it to me, I am going to stick the badge inside my flesh." A third-year middle-school student sold a badge to her. But humanity and conscience continued to survive among people during those chaotic times. After receiving the letter of apology, Cheng Bi had dinner twice with Shen Xiaoke. Shen Xiaoke told teacher Cheng Bi that the reason why he did not beat any teachers was that his home was right next to the Beijing Clothing Factory. The late night cries kept his mother Tian Luping up. Tian told her son that he must never beat anyone. The same heartwarming episodes also occurred to Guan Qiulan during the Cultural revolution. During the 1970's, a student who had gone to university risked her life to come back to visit her at night. At a time before Guan was fully "liberated," this female student came and apologized to her, "I told my parents that you are definitely not a bad person." There were huge risks involved with a secret midnight visit to a "reactionary element" who had yet to be "liberated." Meanwhile, Guao Qiulan felt bad about something else. At the time, there was a teacher named Li Jie at the school. During the Japanese occupation, Li had married a Japanese businessman. Because of the fear that Li Jie's "problem" might implicate others, Guan and the other staff did not dare to speak to Li Jie. At the time, the student body at the Peking University Auxiliary Middle School consisted mainly of the children of military personnel, party cadres and intellectuals. In Guan Qiulan's class, fewer than 10 were children of workers and peasants. It was the same situation at Cheng Bi's Beijing Foreign Language School. 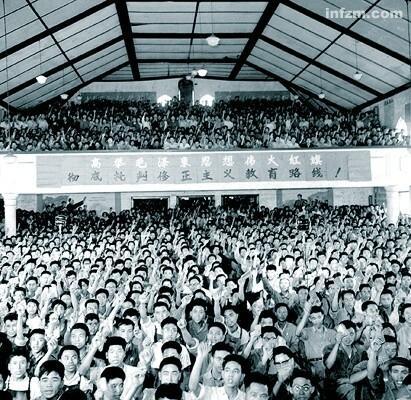 After Premier Zhou Enlai issued the directive of "nurturing from young age, laying down a good foundation" in 1965, more than 5,100 students applied to the school but only 400 plus were accepted. More than half a century later, the two teachers still referred to their now 60-something-years-old former students as "children." "The students were all excellent." Sieving through the pains of the past, Guan Qiulan began to seek inner relief. "How did I figure it out?" She asked us. "I was an overseas Chinese. I never did anything to build New China. When I came back, I went straight into the warm arms of the motherland, from high school to university to work. Who am I compared to the original revolutionaries?" She said that was how she became reconciled. A female classmate of Guo Canhui summarized, "We were all participants of history who didn't know the truth. How much historical responsibility should each one of us individually bear?" She attributed the apologies to personal morality as opposed to other levels. "If you feel guilty inside, you won't be tranquil. This is the minimum morality for a person. It is also responsibility towards future generations. The people in their 60's are still alive." She quoted a "sad and moving" slogan to assess these apologies around her: I used to be a slave, but now I want to be a human.